The public’s appetite for political tell-all books is as strong as ever, but when it comes to the speaker circuit, some political players are having a hard time getting booked. The cultural polarization of America has turned corporations, non-profits and universities away from booking certain high-profile political figures, with bookers fearing a reaction from their audience members, or even worse, getting the attention of President Donald Trump. Investment bank Goldman Sachs is among the most high-profile bookers of speakers. Its “Talks with GS” series, which is distributed through various channels online for the public to watch, recently hosted General Motors chief executive Mary Barra on May 23 and hasn’t included a politician in its bookings since at least the beginning of the year. Liz Bowyer, global co-head of brand and content strategy at Goldman Sachs and head of “Talks at GS,” said the bank is keen to hear from people about topics that go beyond business and include gender, race and climate change. “Politics is highly polarizing and we do have political speakers occasionally, but we want people from across different fields,” Bowyer said. Controversial topics, however, are not entirely on the outs. Numerous talent executives told NBC News that there has been a clamoring for women connected to the "Me Too" movement and a sharp turn towards speakers who can talk about diversity. Epstein said that women involved in Me Too are in demand as are women who broke the through the “glass ceiling.” Jodi Kantor, one of the New York Times journalists who did some of the first reporting on sexual harassment allegations against Harvey Weinstein, is one of the most popular speakers on the circuit at the moment, Epstein added. Diversity of speakers has also become a major factor. Peter Jacobs, head of the speaker department at talent firm Creative Artists Agency, said there has been a distinct effort in the speaker circuit to avoid contentious topics while also making sure more groups are represented. Jacobs said that companies are trying to learn about changing demographics and are looking for help understanding what they should be doing. Among CAA’s in-demand speakers are Shiza Shahid, the co-founder of the Malala Fund, producer and actress Viola Davis, and actor Will Smith. Some politicians remain hot on the booking circuit, particularly for college commencements. 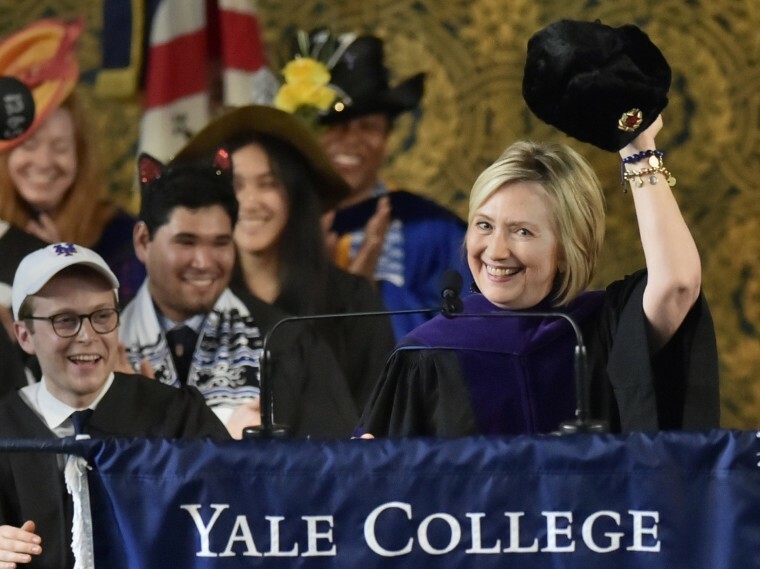 Former presidential candidate, Hillary Clinton, spoke to graduates at Yale University earlier this week, and former U.S. Secretary of State Rex Tillerson gave a commencement address at the Virginia Military Institute this month. Arizona Senator Jeff Flake addressed Harvard Law School graduates. Notably, all three speakers made negative allusions to Trump. Women in Hollywood roundtable: Change in the industry? While companies are still comparatively more cautious about their choice of speakers, Epstein said that universities are playing it safer than they have before — but are still willing to book big names to help attract money from alumni. Some former White House officials from both the Trump and Obama administrations are having a harder time getting bookings, according to one person who is familiar with the speaker booking world. “The demand has decreased a little bit for former White House individuals. That’s some [people] not all,” said a talent agency executive who asked not want to be named since they continue to represent speakers. The people who book speakers are looking for hope, said Lindsay Samakow, an agent in the lectures division at talent agency ICM Partners, which counts TV producer Shonda Rhimes and transgender actress Laverne Cox among its clients. Samakow said that audiences want to come away with an uplifting feeling versus a sense of chaos. “People are looking for clarity and insights from true experts, not just a talking head,” Samakow said.